The B-29A-BN Superfortress is a Rank IV American heavy bomber with a battle rating of 6.3 (AB/RB) and 7.0 (SB). It was introduced in Update 1.47 "Big Guns". 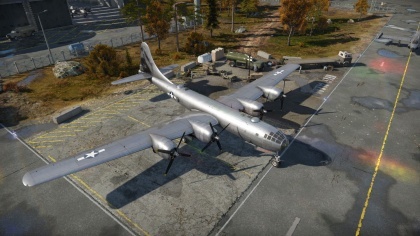 The B-29 follows the B-24 Liberator in the U.S. bomber branch and is the last American propeller powered bomber in the US Tech Tree. It is one of the most powerful and heavily armed bombers in War Thunder. 6.5 mm Steel plate behind rear ventral gunner. The ultimate strategic bomber for the USAF. Loaded up with eight metric tonnes (8 long tonnes) of bombs and ten good ol' Browning heavy machine guns this is the Superfortress! A wonderful advertising name, but don't be fooled, it is bigger than a barn and thus impossible to miss. Keep safe distance from any hot combat zones. Your defensive turrets will not keep you safe, they will kill any foe getting close, but the B-29's enemies do not need too! So concentrate on what this plane is good at: Delivery payload, lots of it. Once your bombing run is complete, start descending towards your airfield; enemy fighters might be trying to find you so you should be even more alert now than before. The B-29 has one of the most powerful defensive systems installed on any bomber, so you should be able to defend yourself reasonably well, unless it is a head on attack where you will have very limited protection. 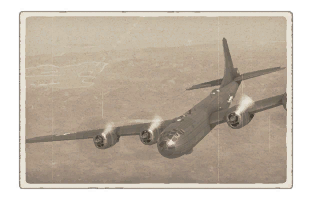 You must also combine it with a defensive style of flying to utilize it to its full potential; the B-29 offers great handling for its size. Despite this, be very careful when you enter a dive. It is just as prone as any other aircraft to suffering structural damage if its limitations are exceeded. Great defensive armament will kill most enemies that do get close. Being able to point at least four fifty-cals in every direction and about six to the six o'clock position will deal with any fighter quickly. But do not forget the size of the Fortress. Most of the enemies shells will hit some mark. Of course, bomb load is very good with the B-29, with its historic performance as one of the best American bomber in service. Up to 8 x 2,000 lb could be carried in the bomb bay. The B-29 was one of the, if not, the largest aircraft used during World War II. It was exclusively used in the Pacific Theatre during the War, and participated in bombing raids on multiple islands in the Pacific war. The B-29 became the world's first and only nuclear capable bomber to deliver weapons during war time when on August 6th, 1945 the B-29 Enola Gay dropped the atomic bomb known as "Little Boy" on Hiroshima, Japan. Three days later, the B-29 Bockscar dropped the second atomic bomb "Fat Man" on Nagasaki, Japan. During the Second World War, its only area of operations was the Pacific Theater specifically targeting the Japanese mainland. It also saw combat service in the Korean War a small group of loaned aircraft were evaluated by the R.A.F during the early 1950's as well. In British service they were known as the “Washington B Mk. 1”. During World War 2, the B-29 completed over 20,000 sorties with an estimated 180,000 tons of bombs dropped, as well as two atomic bombs. A total of number of 3,970 were built and delivered to the USAAF. Perhaps the most famous “copy” of the war was the Tu-4. Although outwardly looking identical, this Soviet “B-29” was converted to metric making it unique. Other aircraft derived from the B-29 include the B-50, C-97, KC-97, 377 Stratocruiser, and NASA’s own Guppy cargo carriers. The B-29 post-war also helped in the scientific, research, and development fields. They would play a key role in hurricane hunting and storm chasing which allowed it to collect key information about storm patterns, and helped to improve and to develop new radar systems such as the “sun tracker”. It was also the aircraft that carried the supersonic test aircraft Bell X-1 into the air. The last American B-29 squadron was retired in the 1960’s. Today one called “Fifi” still flies at air show circuits. It is hoped another named “Doc” will soon join her. Skins and camouflages for the B-29A from live.warthunder.com. ↑ 1.0 1.1 Excerpts from 'Profile' B-29 Superfortress, no Author mentioned.